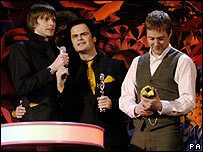 The 2007 Brit awards will be broadcast live on TV for the first time in almost two decades, it has been revealed. The ceremony was shown live until 1989, when a shambolic show hosted by Mick Fleetwood and Samantha Fox led to the decision to tape the awards in advance. 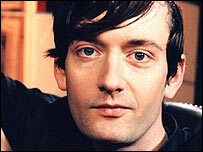 "British music is in one of its most exciting phases," said Peter Jamieson from the Brits committee. "So what better time to take the show live?" Organisers have dropped the best rock and best urban act awards for 2007. The best pop act category, which this year was won by James Blunt, has also been discontinued. "The Brits has to be about celebrating the very best of music across the board," said the awards' co-chairman, Nick Phillips. However, some of the nominations in these genre categories caused controversy this year. Girls Aloud and McFly were omitted from the best pop shortlist, for example, because the award is based on single and album sales. This meant that Katie Melua and James Blunt both received nominations, despite protests from some quarters that they were not true pop acts. At the ceremony, rock group Kaiser Chiefs were the main winners - taking home three prizes including best British group. Other recipients included Coldplay, James Blunt, and US act Green Day, who each walked away with two awards. The 1989 Brit awards were the last ones to be shown live on television. Regular presenter Noel Edmonds was replaced by musicians Mick Fleetwood and Sam Fox, who constantly fluffed their lines. Guests arrived late and a pre-recorded message from Michael Jackson was somehow dropped from the show, even though it under-ran. Memorable moments included Fox and Fleetwood introducing the Four Tops, only for Boy George to walk out on stage. "I'm afraid I'm just the one Top," he told the crowd at the Royal Albert Hall. Since then, the show has been taped a day in advance - allowing for mistakes and gaffes to be edited out. But this has also robbed TV audiences of the chance to see some of the Brits' more memorable moments - such as the time Jarvis Cocker jumped on stage with Michael Jackson in 1996. The 2007 Brit awards will be held at London's Earls Court on 14 February, and will be shown on ITV.